Happy Wednesday! Things are slowly getting back to normal over here after our trip. Thank you for your well wishes and patience while I was away! As soon as I have photos I'll be sure to share a few! I have a few projects waiting to be photographed, quilts to bind, and lots to share about my book over the next few weeks! In the meantime, I wanted to share two recent knitting finishes! 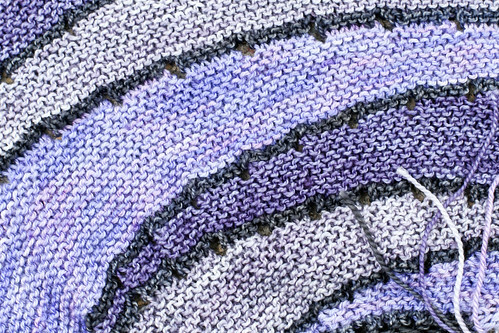 Above is my newest work in progress, an Exploration Station shawl. 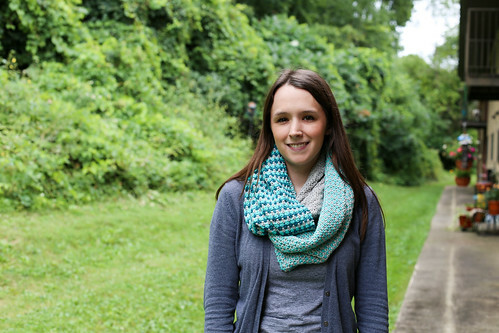 For most of the summer my main project was a colorwork cowl. 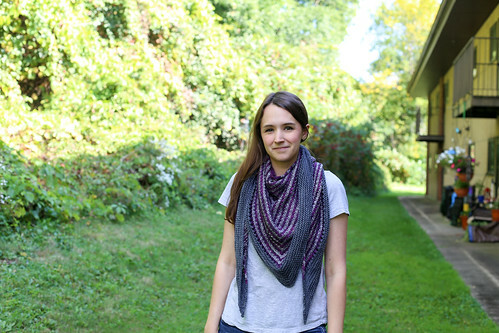 The pattern is called the Stitch Block Cowl and it's free on the Purl Bee Blog. 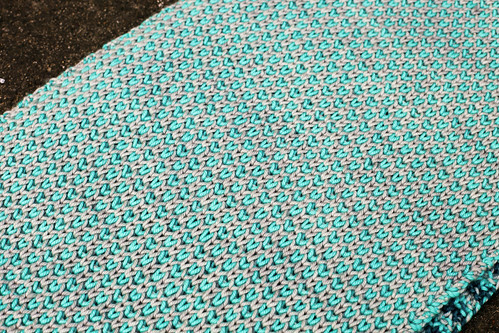 I have had it on my list for a long time, but finally moved it up the queue for the Eat Sleep Knit Yarnathon knit along! It was such a fun knit! The cowl is worked in three sections, each section adding another color to the mix. I used Madelinetosh Tosh Vintage for all three colors, in Astrid Grey, Button Jar Blue, and Kelp. These colors are a bit outside of my normal purple/gray, but I love the finished product. The turquoise and teal will match my winter coat perfectly! Now it just needs to get cold! For more photos and information see my Ravelry page. Next up, is a new shawl that I finished in the car on the way back to Wisconsin! I actually started this shawl on our trip to Ohio for Christmas last year! 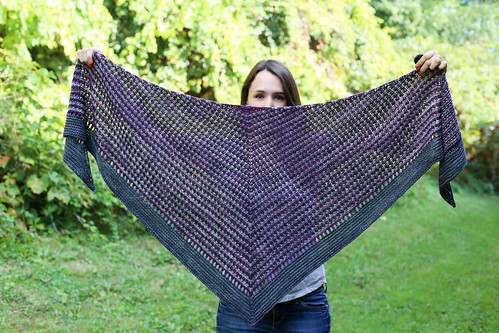 The pattern is the Great Divide Shawl by Michele Brown. 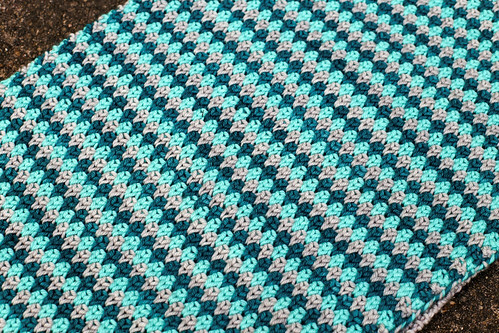 I started this pretty quickly after finishing my Daybreak and was in the mood for more stripes and ended up with a similar color scheme. This shawl is knit up in DK weight yarns. 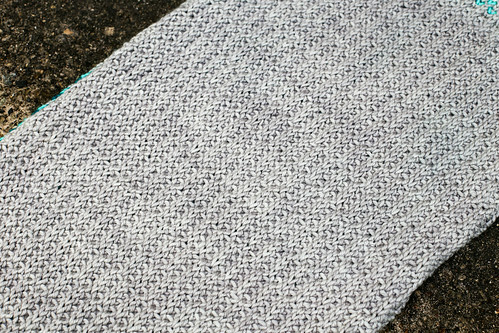 The two gray yarns are Madelinetosh DK in Tern and Charcoal. 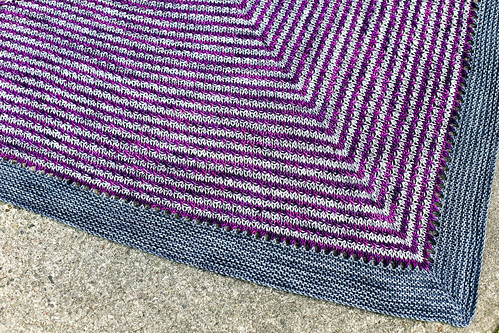 The purple is Tanis Fiber Arts Yellow Label DK in Plum. The Tanis is SO pretty in person, and super duper soft! This was another Eat Sleep Knit Yarnathon project, this time for the Booster Club. I made this shawl quite a bit bigger than the pattern suggests. I have an easier time wearing giant shawls, and this one turned out huge! For more on my modifications and more photos see my Ravelry page. Love all these! Your use of colour is fab!